At Vision Dental, our mission is to create a warm and nurturing environment where your child will feel safe and relaxed while receiving the highest quality dental care. Our focus is on preventive dental care and ideal yet conservative dental treatment. We encourage a positive attitude toward visiting the dentist. 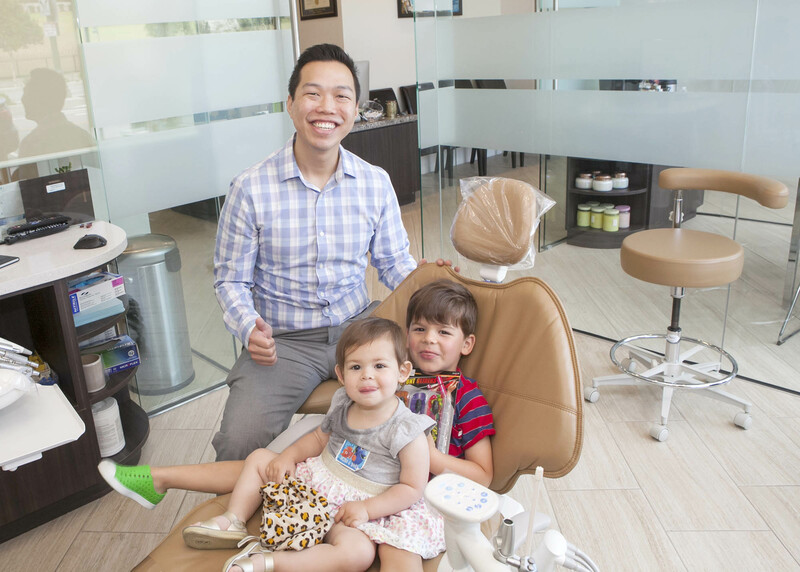 With a personal approach, Dr. Andrew Huynh and the Vision Dental Team hope to provide a comfortable high quality dental home for children of all ages and backgrounds while building long-lasting relationships. The American Academy of Pediatric Dentistry (AAPD) recommends a child’s first dental visit should be by age 1. An early start at the dentist can help identify minor dental issues before they become major ones down the road. With your help, Dr. Andrew and the Vision Dental Team hope to make your child’s first dental check-up a positive and fun experience! The first dental visit typically focuses on parent education, a thorough exam/cleaning, fluoride application, and introducing kids to our friendly environment. Common topics of discussion are when to expect new teeth, how to help a child brush, pacifier/thumb-sucking, bottle/sippy cup use, and what types of foods/beverages are best for dental health. When dental treatment is necessary, Dr. Andrew Huynh will work with you to tailor a treatment plan unique to your child’s needs with an emphasis on preventive measures. Dr. Andrew only treats what is necessary and prides himself in providing high quality yet conservative dental treatment. Your child will benefit from using the same premium materials and equipment as we do on our adult patients. Private rooms with plush chairs and televisions can help your children feel right at home at each visit. We use the highest quality resin composite (white) fillings, and can even help your child with ceramic instead of stainless steel crowns! When ready, your child can be referred in office to the orthodontist ( Dr. Nicole Cheng ), or the general dentist ( Drs. William Cheng and Rogelio Garcia ). It can be very convenient to come in for your orthodontic visit, and have your recall exam and cleaning at the same time! Our team of doctors work together and communicate daily regarding patient referrals and cases. How is Vision Dental Pediatric Dentistry Better? For more information about our pediatric dental services or to schedule an appointment, contact us today!